This seemed like a perfect book to feature for National Tabby Day! Details at the end of the post on how to enter to win a copy of Making the Most of All Nine Lives: The Extraordinary Life of Buffy the Cat. Buffy is no ordinary orange tabby. He is patient, and not only puts up with all kinds of costumes, but will pose for the camera when wearing them. 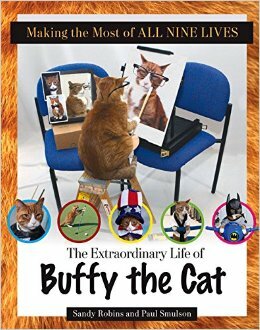 This is a photo book, by Sandy Robins and Paul Smulson, of life with Buffy who is Making the Most of All Nine Lives. In the photos, he’s off leash, a remarkable feat for a cat under any circumstances, but to do this at the gas station while pondering the price per gallon or pumping a tankful or wearing a bat-cat outfit is, well, extraordinary. Photos have not been photo-shopped. Smulson says he never thought of himself as a cat person until Buffy and Smokey moved in with his family. Even then, he had no idea of Buffy’s potential. One day Smulson put earphones on Buffy and was amazed the cat didn’t swipe them off. He grabbed the camera while Buffy cooperated and posed. The rest, as they say, was history. Readers will enjoy seeing Buffy build a snowman, grill dinner, ride a horse, or do a self-portrait. While the photos are great by themselves, Robins’ captions make it clear she can read Buffy’s mind. Each picture is cuter than the next, making this the perfect pick me up for a bad day at the office or a wonderful gift for any cat lover — after you’ve read it yourself first, of course. Bravo Buffy! When’s the next book coming out? To enter to win a copy of Making the Most of All Nine Lives: The Extraordinary Life of Buffy the Cat, simply email KRL at krlcontests@gmail[dot]com by replacing the [dot] with a period, and with the subject line “buffy,” or comment on this article. A winner will be chosen May 7, 2016. U.S. residents only. If entering via email please include your mailing address, and if via comment please include your email address. Cats can really steal our hearts so quickly. Buff sounds like an unusual cat, most have a mind of their own and definitely don’t like the idea of getting dressed up or wearing anything on their heads. The book sounds delightful. Buffy sounds very intriguing! Our furry four legged friends make our lives complete and grow in our hearts forever! Looking forward to this read!